BIOSTAR adds a micro-ATX RACING B450GT3 motherboard featuring the newly released B450 chipset for mid-ranged motherboards that support the first and second generation AMD Ryzen processors. The BIOSTAR RACING B450GT3 is packed with features found in high-end gaming AM4 motherboards: complete management of RGB lighting with VIVID LED DJ and 5050 LED FUN ZONE, Dual BIOS for auto recovery, Iron Slot Protection which is built on the BIOSTAR signature premium black RACING themed PCB design. 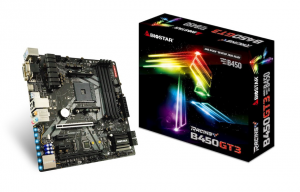 The BIOSTAR RACING B450GT3 motherboard’s rear I/O ports includes: 1x PS/2 keyboard/mouse, 1 x USB 3.1 Gen2 (10Gb/s) Type-C Port, 1 x USB 3.1 Gen2 (10Gb/s) Type-A, 2 x USB 3.1 Gen1 (5Gb/s) Ports, 2 x USB 2.0 Ports, 1 x HDMI Connector (resolution up to 4096×2160@30Hz), 1 x DVI-D Connector (resolution up to 1920×1200 @60Hz), 1 x VGA Port (resolution up to 1920×1200 @60Hz), 1 x LAN port and 6 x Audio Jacks.